This project recreated the smell of the area around the Béton Salon and branded it as a perfume from the House of Béton, mimicking the perfume houses traditionally linked to Paris. The area of the 13th Arrondisement where the Béton Salon is located is a completely new area of Paris, with none of the architecture or romantic ideals for which Paris is known. I recreated the smell of the area by taking various people on blindfolded tours, refocusing their experience of the area through their olfactory sense. A map of the walk each person took was made detailing where and what they had smelled during their journey. Samples of the things they had smelled were placed alongside the maps. All this information was then sent to Geza Schoen, a perfumer in Berlin, who interpreted it into a perfume. 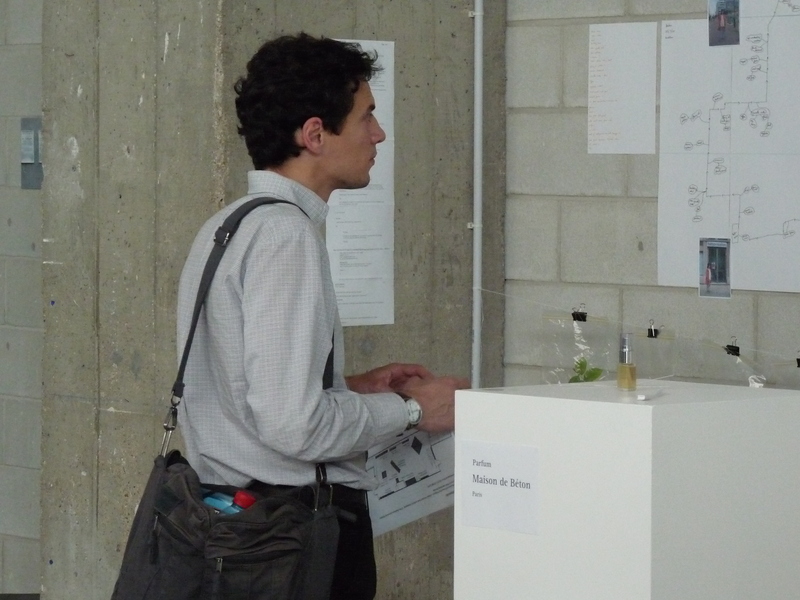 The perfume was displayed alongside the maps and smell objects and people were invited to smell it and make their own judgment on whether or not it matched their experience of the area. This project offered a way to evaluate this area of Paris, asking how much of what we perceive of a place is actually based on our preconceptions of it?